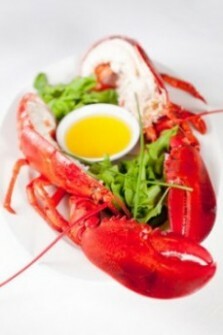 June 15, 2011 is National Lobster Day. So foodies everywhere, let’s celebrate. Whether the lobster is grilled, steamed or baked, the result is always going to be the same: Absolutely scrumptious. National lobster day is the prefect day to host a lobster clambake at your house. Invite all the Dads and Grads, the neighbors and the rest of the family and cook up a storm. Start your own tradition. For New England, the lobster clambake has been a tradition longer than America has been a country. History tells us that the Pilgrims watched Native Americans gather lobster, clams, mussels and fish and prepare them on the beach. The Native Americans dug a sand pit and lined it with hot rocks and coals. They added the lobster and clams to the pit and covered them in fresh, wet seaweed and more hot rocks, steaming the lobster and shellfish in seawater. If digging a clambake pit is not your thing, just go ahead and get a big pot and steam or boil them. They will be just as delicious. What to look for in selecting live lobster to prepare? Most important, make sure they are fresh. Everyone knows the world’s best lobster come from Maine and Massachusetts. But what good is that if your table is in Kansas? Don’t worry; you don’t have to go to Maine. There is a service on the web that will deliver live Maine lobster right to your front door anywhere in the United States. Order your lobster with all the best seafood the cool, crisp waters of the Atlantic Ocean can offer. For a more intimate celebration, start your dinner with some fresh Oysters from Cape Cod. Serve the oysters paired with chilled champagne or white wine, a good Chardonnay is best. Follow up with jumbo shrimp cocktail. Steam the lobsters, and crack the claws and tails ahead of time with a large knife to make eating easier. Serve with butter and lemon on the side. Don’t forget the candles. National Lobster Day celebrates the fact that lobster is the largest of all the seafood harvest in New England. Popular world wide and known as a delicacy, Lobster makes any occasion more fun. So let’s celebrate.